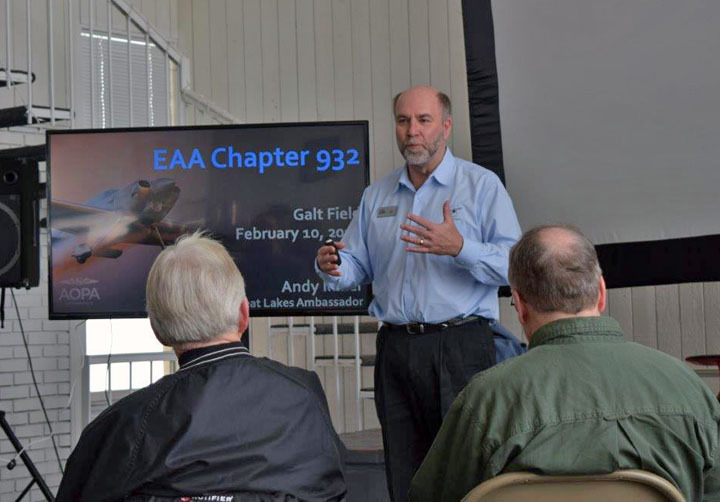 At our February 10 Chapter Gathering, EAA 932 was pleased to host guest speaker and fellow EAA member, Mr. Andy Miller from the Aircraft Owner’s and Pilot’s Association (AOPA). 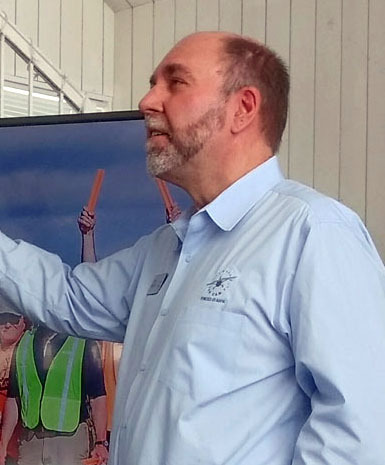 In his capacity as the AOPA’s Great Lakes Ambassador, Andy covers six states…in the air when he can, and on the ground when he has to. 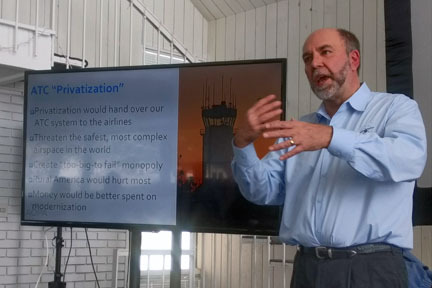 On this particular Saturday, Andy woke at 4AM in Appleton, WI and, in spite of the wind and snow that kept our chapter attendance low, he made the 3 hour drive down to Galt to give us an update on the current state of General Aviation. The man shows some serious dedication! 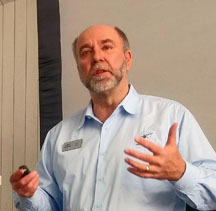 Andy’s outlook is expressed by his attitude and message: that there is a lot of good news in the aviation world today. Some of the major items that AOPA has taken the lead on are described below. Click on the links that follow each topic’s paragraph to open a new window where you can find more information. Also, the subject of ATC Privatization has popped back into the news with President Trump’s proposed budget. The AOPA has been working closely with the EAA and with members of Congress to insure that the opinions of private pilots are heard in Washington. Some sobering news: the number of certificated pilots continued its dramatic decline, with more than a 25% drop since 1980. Even worse is the news about new pilots: 50,458 Private Pilot Certificates were issued in 1980. Last year, there were just 14,202. This year, the AOPA will be hosting a number of two-day fly-ins in various regions of the country, presenting their positive message about the future of General Aviation. Workshops, seminars and a chance to connect with other enthusiasts offer the chance to learn, experience and explore all things aviation. Check out the schedule at: https://www.aopa.org/community/events/aopa-fly-ins/2018-aopa-fly-ins. Back when the EAA and AOPA were much younger organizations, some of us remember a kind of competition that existed between them. Today, with leadership changes and maturing attitudes on both sides, there is a recognition that we need each other’s talents, energy and expertise. The fact is that over 80% of EAA members are also AOPA members. 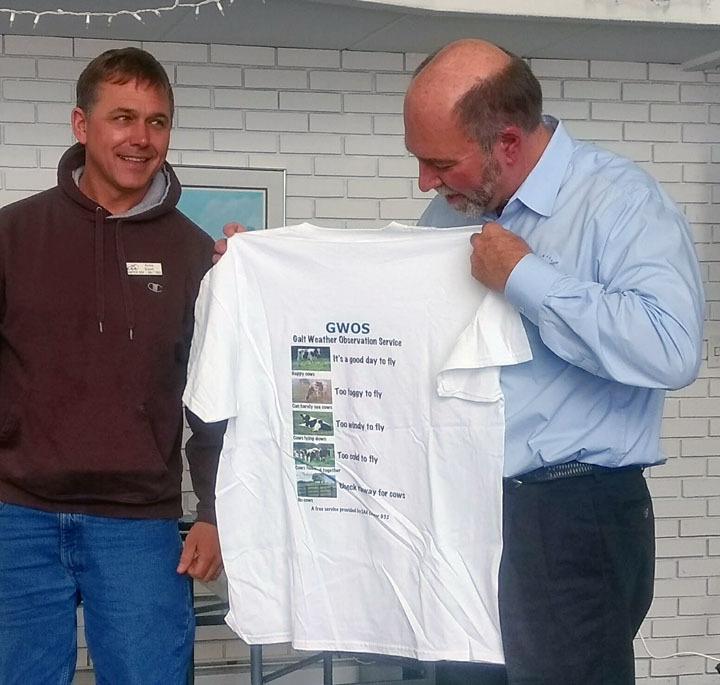 Both organizations are working with us and for us, toward goals that are mutually beneficial. In Andy Miller, we’ve found not only a fellow EAAer, but also a friend at the AOPA. We’re pleased to have you, Andy!